This cake sounds so good and it is healthy!!! It uses a box cake mix (makes it faster). What more could you want? In a large bowl, combine the cake mix, gelatin, water, egg whites, applesauce, oil, lemon extract and food coloring if desired; beat on low speed for 30 seconds. Beat on medium for 2 minutes. Pour into a 13-in. x 9-in. baking pan coated with cooking spray. Bake at 350° for 25-30 minutes or until edges are lightly browned and a toothpick inserted near the center comes out clean. Cool on a wire rack for 10 minutes. 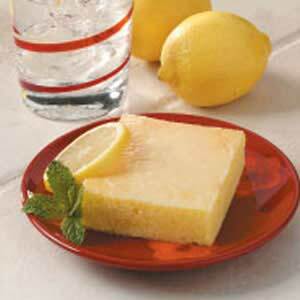 Meanwhile, for glaze, in a small bowl, combine confectioners’ sugar and lemon juice until smooth. Drizzle about a third of glaze over cake; carefully spread evenly. Repeat with remaining glaze. Cool completely. Yield: 15 servings. Nutritional Analysis:1 piece equals 225 calories, 5 g fat (1 g saturated fat), 0 cholesterol, 266 mg sodium, 43 g carbohydrate, trace fiber, 3 g protein. This cake just looks so pretty and the recipe is easy! I think I might just try it for Easter! 1.Preheat oven to 350 degrees F. Prepare and bake cake mix according to package directions using two 8- or 9-inch round baking pans. Cool on wire racks for 10 minutes. Remove from pans. Cool completely. 2.Place 1 cake layer on a serving plate; spread with frosting. Top with remaining cake layer. Frost top and side of layers with frosting. 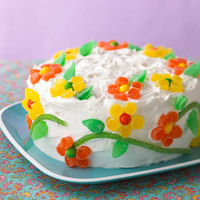 3.To decorate cake with flowers, slice small gumdrops in half horizontally to form flower petals. Use candy-coated fruit-flavored pieces for flower centers. Flatten gumdrops and cut into leaf shapes for leaves. Snip sour straws to desired lengths and use for flower stems.